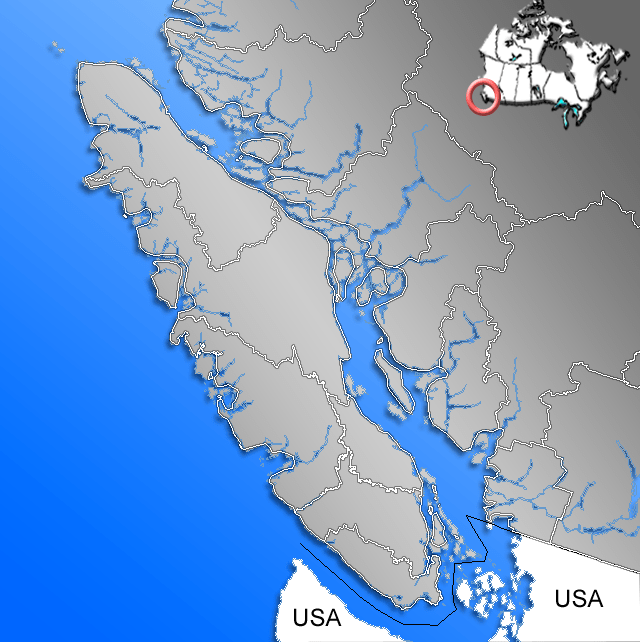 Vancouver Island is located on the west coast of Canada. It is part of the province of British Columbia, and is home to the provincial capital of Victoria. The island itself is 460 kilometres (290 miles) long, and at its widest point is 80 kilometres (50 miles) wide. The total land area is just over 31,000 square kilometres (12,500 square miles) – that’s a little bigger than Sicily, a little smaller than Taiwan. The population of the island is around 740,000 people, and nearly half of these residents live in the Greater Victoria area. The majority of the cities and towns are in the southeast portion of the island; a main highway runs the length of the island along the eastern coast. We are lucky to have an incredibly mild climate here, especially compared to the rest of Canada. In the winter it rarely drops below freezing, and we usually get just one or two snowfalls that last for a few days each. In the summer, the temperature usually stays in the mid-twenties with a couple of days where it might reach 30°C (86°F) or so. It’s pretty rainy pretty often, although the rain shadow created by the surrounding mountain ranges means that the east coast of the island is much drier than the west coast. For example, the average annual precipitation in Victoria is 883 millimetres (35 inches). That might seem like a lot compared to Los Angeles’ average of 373 millimetres (15 inches), but it pales in comparison to the west coast of the island, which can receive up to 6,650 millimetres (262 inches) a year! Henderson Lake, near the town of Port Alberni on the west side of the island, is the wettest place in North America. Vancouver Island has a diverse range of ecosystems. It is generally characterized as a temperate rainforest consisting of the Coastal Douglas Fir, Coastal Western Hemlock, and Mountain Hemlock ecosystems. As such, it is home to Canada’s oldest and largest trees. There are also gorgeous Alpine Tundra meadows in the island’s mountain regions, and the southern tip of the island hosts the northernmost reaches of the Garry Oak Meadow sub-ecosystem. In terms of wildlife, the isolated nature of the island means that many of the species that are present on the mainland coast of British Columbia are absent on the island: there are no grizzly bears, mountain goats, porcupines, skunks, coyotes, or moose. However, the island is home to a number of remarkable species, including most of Canada’s Roosevelt Elk and the highest concentration of cougars in North America. In addition, two endangered mammals – the Vancouver Island Marmot and Vancouver Island Wolf (a subspecies of Grey Wolf) – are found only on the island.